Fly Ash Bricks & Paver Block Machine, KE_004. Our technical experts have helped us to design and develop vast range of Fly Ash Bricks & Paver Block Machine which have wide industrial application and are available at very competitive prices. Our entire manufacturing process is supervised by a skilled team of quality auditors who ensure that all the products are made in compliance with the international quality standards. We also provide customized forms of all the products offered under in this category. Heap Area: 7,000 to 8,000 square feet. Machine Capacity Mentioned is only for guidance, it will vary with materials. 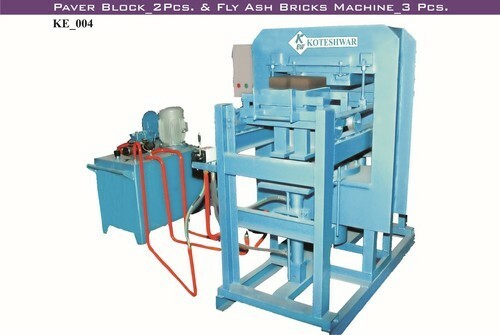 We “KOTESHWAR ENGINEERING WORKS” are Manufacturers of Multi Purpose Plant, Automatic 2 in 1 Plant, Bricks making plant, interlocking Paver Block Plant, Mixer Machine, and Material Handling Machinery, Fully Automatic Machine, Semi Automatic Machine & Manual machine of Hydraulic System & Vibrating System Machine for Fly Ash / Cement Bricks, Interlocking Colour Paver Block, Solid Block, Kerb Stone & Chequered Tiles Making Plant. The entire range of offered products is designed in compliance with the international Quality standards and norms at our well manifested manufacturing unit. These products are available in varied sizes, grades and other specifications as per needs of the patrons. This industrial machinery is extensively demanded for their attributes like dimensional accuracy, resistance to rust & abrasion, seamless finish and loner service life. Besides, we check the quality of these offered products on certain quality parameters to make sure that our patrons get a defect free and flawless range from our end. Quality is the cornerstone of ”KOTESHWAR ENGINEERING WORKS ” success. We’ve worked hard to establish a reputation for quality and also, we are trying our best to be one of the world’s leading construction machinery manufacturing companies.